First one. It was a tie. Scanned closeup. Slightly doctored image. 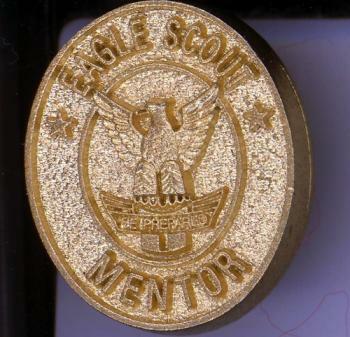 Louie gave pins to each of the adults who helped him earn Eagle Scout. Unlike others who have picked a favorite, he decided we were all his mentors. Even though it was a tie, I appreciate earning my first Eagle mentor award. 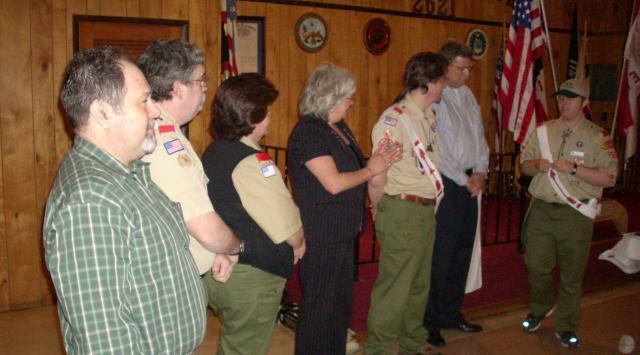 From left to right: Mr. Mark, Mr. Joe, Ms. Terry, Ms. Judy, Klamachpin Allogagan, Mr. Tom, Louie the Eagle Scout. On the Greenmonk Energy & Sustainability show http://www.ustream.tv/recorded/1319778 30-Mar-2009, Tom Raftery talked about someone's ideas on shower water heat recovery. I did a little back-of-the envelope calculation, then went to the Internet to check my assumptions. Let's assume I use equal amounts of 50 degree cold water, and 130 degree hot water for a ten minute shower, using 3 gallons per minute. The water mixture is 90 degrees, starting from 15 gallons cold and 15 gallons hot (assuming my thermodynamics are correct). If I had a magic heat exchanger that warmed up the cold water 10 or 20 degrees, I might be able to change the cold/hot ratio so I used 18 gallons of not-so-cold water, and 12 gallons of hot water. I can't raise the drain water above 90 degrees, as that's what it is already. Though I think the 20 degree rise is optimistic, the resulting savings is: 3 gallons of hot water not used. Or, to put it another way, a shower about 2 minutes shorter. Well, perhaps a shower head shut off valve would be cheaper and easier to install. Space? Where do I put this unit? In my case, it would need to go somewhere in the first-floor kitchen, which is beneath the shower unit. So, we're talking some major renovation to open the walls, find the supply and drain lines, and repipe both. Probably a serious time delay and inconvenience. Cleanout? Supply lines are under pressure, drain lines are not. Generally, keeping wastewater flowing is desirable so that solid deposits don't build up. I've snaked the drain line a few times to get out the hair and other clogs, and don't really want to picture what a unit that coils cold water inside that will look like in a few years. Cost? For best heat exchange, we're probably talking metal, so replacing plastic drain lines with copper is a big investment. My house is old enough to have copper supply lines; newer ones probably have plastic. And it's likely the supply lines aren't near the drain lines, so a large rerouting is in order. A U.S. Government site (eere.energy.gov) says "Paybacks range from 2.5 to 7 years" yet with no published basis for this claim. Maybe my 3 gallons of hot water conserved each day will add up to several hundred dollars electric usage avoided over 7 years? Start up time could be a couple minutes, as the cold water isn't being heated up until enough hot wastewater passes through. They estimate a savings of 20% hot water (just like I figured). Another useful site I found is http://www.bio-radiant.com/WaterCal.html to calculate actual energy costs of hot water usage, with projections of alternate sources. It appears we're spending several hundred dollars per year on hot water for showers, dish washing and clothes washing. Time to measure these a little more. The first case is where your local utility, whether voluntarily, or through regulatory requirement, generates electricity that doesn't generate carbon dioxide, or that is from renewable sources. This green power might be a set portion of the electricity you use, or you may be able to choose how much green power you want to consume. The second case is when your local utility isn't your power supplier, just the power delivery system. You can choose to buy your power from a variety of suppliers, including 100% wind, 100% solar, or other choices. We've gone with wind. This last is a 49 page document titled "Green Power Marketing in the United States: A Status Report (11th Edition)", by Lori Bird, Claire Kreycik, and Barry Friedman. I'm still reading through this, but have found several fascinating observations. This shows large corporations and municipalities that have progressed in the adoption of alternative energy sources. For example, at number 15 is Starbucks, showing 22% of energy use from wind sources. Who knew? Nine states, and the District of Columbia, allow consumers to purchase competitive electricity. That's not many; a majority of these are in the northeastern United States. Under "Customer Participation" starting on page 5, it looks like under 1,000,000 consumers have chosen to go green. So far. Marilyn - I am privileged and honored to know many of the people you cited, through SCN and through ASUG. Many ASUG volunteer leaders are women; one whom I'd like to recognize is Carolyn Pickton, a leader in the Data Governance group. She remained an active community volunteer even through a career change, contacting us via her personal email until her new employer came on board. She has organized events, including an annual free conference for 200-300 experts in master data management, held in the midwest of the United States. Carolyn's public profile is visible on LinkedIn. There it shows she has a Masters degree in Information Technology, and is the Data Governance Manager at Leprino Foods Company. While the ASUG.COM links are visible to members only, Carolyn's leadership in the BITI group has contributed to 2 successful year-round community meetings of her peers in the data governance field, and the 2009 plans are shaping up for yet another win. Carolyn also handled both the program chair and SIG chair duties when the prior program chair went vacant. 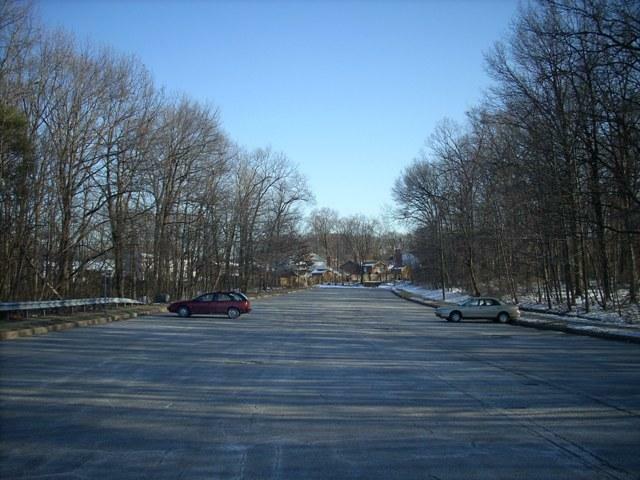 It's a lonely job, parking in a commuter lot when almost no one else bothers, or knows about it. But it's usually me, maybe a taxi cab, sometimes the driving education parallel parking practice. Once in a while 3 or 4 cars and trucks sit nearby. The lot isn't quite as big as this portrayal, as there are no parking signs just in front of the car on the left. I have no idea why, since the rest of the paved area is totally wide open, and buses (should any ever wander by) could make donuts in the foreground. I had leftover shelving, and thought it might work in the bathroom. The trouble was the roof is slanted, there is a skylight, and who knows what is behind the drywall? I found a few joists/studs with the stud-finder, not in the most convenient place for the size of the shelf. Because of the stud location, I needed hooks and chain for the outer shelf edge. The inner edge could go up against the wall -- the helpful folks at Hodges Hardware sold me a handful of clips that were intended for wiring, and re-purposed as clamps. The chain hangs from brass hooks (also from Hodges). Originally I looked at hook eyes, but that would add more S-hooks. The galvanized metal chain I'm using temporarily until I get a few feet of brass chain to better match the hook. 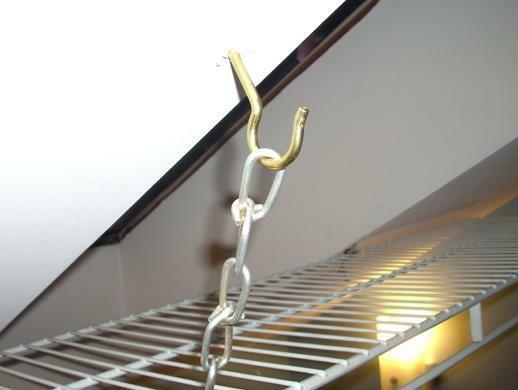 This is a closeup of the clamp anchoring the shelf into the wall around the skylight. If you look close you can see it has an insulated center; this helps keep the shelf steady. The twist tie was a marker to keep the centered shelving location correct. There isn't an anchor behind this screw, it simply goes into the metal drywall edging. Normally I would not trust any weight to that metal; this shelf has 2 outer clamps that have drywall expansion screws in them (see "drilling" below). The photos and video clips aren't in chronological order, as I put up 2 shelves on different days (had to go back later for more clips after seeing how well the first shelf held weight). 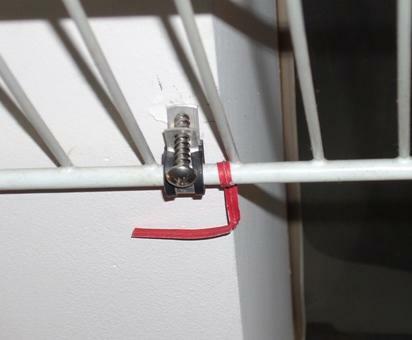 The screw job video clip shows manual screwing of the 2 inner clamps and the pivot step afterward. The drill sounds rather whiny as it probably needs a touch of oil. I'm using it to drive a screw into a hollow wall anchor. The first step (not shown) was drilling the hole for the anchor, next, driving the screw in to expand the anchor, and finally, as shown, screwing it tight.